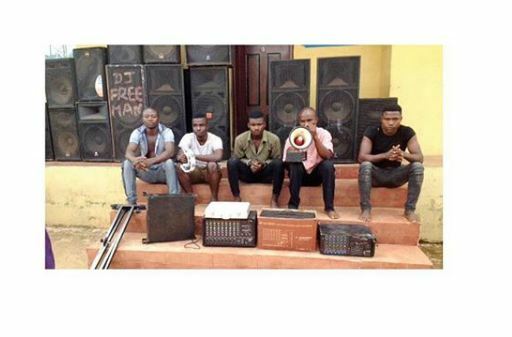 Five persons have been arrested by the police for allegedly stealing musical and communication instruments belonging to Holy Ghost Cathedral Church, Enugu. . The State Police Public Relations Officer, Ebere Amaraizu, said the police had recovered all the 15 stolen speakers and communications equipment of the Cathedral Church. . He noted that the principal suspect, one Chukwuebuka Onwe (22), was a security guard working in the Church before a generating set was allegedly stolen in the Church and was traced to him and his other cohort then. . According to him, Onwe, disappeared after the incident. But in what may appear as unrepentant act, he later initiated another line of a criminal act in which he suddenly comes into the church in the early hours on several occasion where he allegedly carted away 15 speakers and other equipment. It was however gathered that his evil deed and that of his cohorts came to the end as he was promptly arrested around Nkpor axis of Anambra by police operatives of both Anambra and Enugu States who had shared information about him.